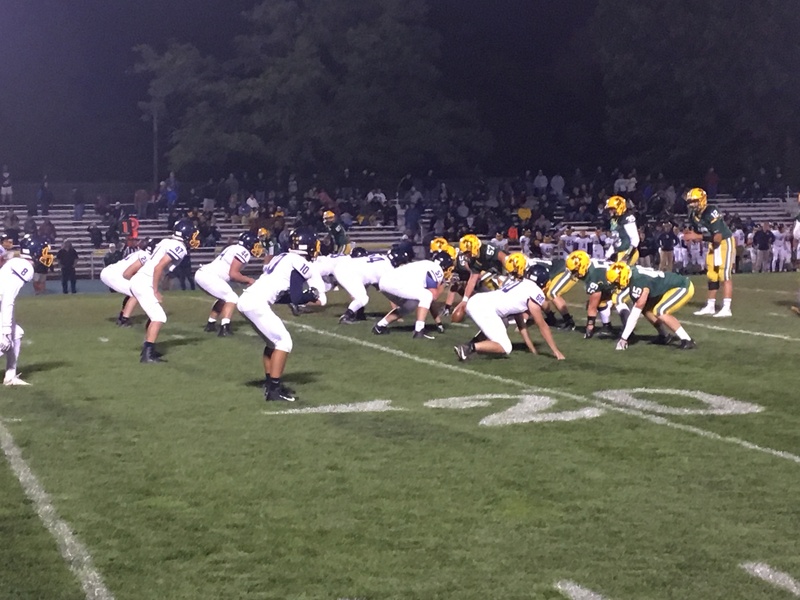 AMHERST, OHIO– Both the Olmsted Falls Bulldogs and Amherst Comets earned their 4-1 overall records coming into Week 6 due to outstanding run games. Friday night’s contest between the two provided more of the same, but it was the Bulldogs who were able to successfully neutralize their opponent, and come away with a 39-14 win. Amherst relied on Khennedy Scagliozzo for most of the game, while Olmsted Falls looked to use a variety of options. Ultimately, that’s what made the Bulldogs more successful. Scagliozzo ended the evening with 32 carries for 157 yards and two touchdowns. He was also three-for-eight passing for 22 yards with one interception. Scagliozzo accounted for a majority of the Comet offense, but that was exactly what the Bulldogs wanted coming into Friday night’s game. Amherst only had three other players involved with their offense, as Evan Shawver ran for 21 yards on eight attempts. Nick Keron caught two passes for 18 yards while Dominic Harsa caught one for four yards. But that sums up the entirety of the Comet offense. For as great as the Bulldog defense was, they had plenty of positives on the offensive end as well. Olmsted Falls had four players score touchdowns, as many as the Amherst team had involved in their entire offense. Olmsted Falls got on the board first, scoring on their only passing touchdown of the night with a 26-yard lob from quarterback Teddy Grendzynski to wide receiver Braden Galaska with 5:10 remaining in the first quarter. The Bulldogs took a 6-0 lead after a blocked extra point from Amherst’s Matt Lee. In the opening seconds of the second quarter, the Bulldogs scored again when Jack Spellacy completed a three-yard run into the end zone for his first score of the night, giving the Bulldogs a 13-0 advantage. The Comets answered on the ensuing drive, however, as Scagliozzo scored on a five-yard touchdown run, after completing 16-yard and 31-yard runs the two plays prior to the score. While Amherst looked like they were beginning to close the gap, Olmsted Falls answered with another score in the final minutes of the half when Michael Howard, who ended the game with 62 yards on seven carries, ran the ball in for an 11-yard score to put the Bulldogs up, 20-7. Clearly struggling to get any kind of offense going, Amherst came out seemingly reinvigorated after the break. The Comets scored on their first drive of the second half, when Scagliozzo completed another five-yard touchdown run to narrow Olmsted Falls’ lead to just one touchdown. That score would be the final one for Scagliozzo and the Comets. To close out the third frame, the Bulldogs’ Spellacy scored his second touchdown on a 19-yard run to put the lead back up to 12 points, 26-14. Spellacy ended the game with 17 carries and 93 total yards. Adding insult to injury, as Amherst began the fourth quarter with the ball Galaska intercepted a Scagliozzo pass and ran it back for 70 yards to the Amherst five-yard line. He ended the evening with 50 receiving yards as well. On the first play of the drive, Luke Lombardo found the end zone on a six-yard run, breaking the game open and giving the Bulldogs a 32-14 lead. Lombardo was the second most effective rusher for Olmsted Falls, ending the evening with 89 yards on 13 carries. The Bulldogs managed one last score as Grendzynski completed a one-yard run with about two minutes to go in the game. Grendzynski ended the game going four-of-six passing for 60 yards. All in all, the second half went about as well as Olmsted Falls could have hoped for, especially considering the adversity they faced to open the third quarter. Olmsted Falls improves to 5-1 overall and 4-1 in the SWC. The Bulldogs will play host to the Berea-Midpark Titans next week. Amherst drops to 4-2 and 3-2 in conference play. They will head to Avon Lake in Week 7. Jack Spellacy gets the honor this week. Olmsted Falls had a variety of options, but Spellacy was the only player with multiple touchdowns for the Bulldogs. He ended the evening with 93 yards on 17 carries and two touchdowns (three yards, 19 yards).